Have you ever thought about biking all 600 miles of the paved state trails in Minnesota? Well, that’s what our intern, Karl, is doing this summer. And you can follow his journey, which began on July 26 on the Brown’s Creek State Trail. screenshots from our Facebook and instagram posts. We’ll be posting his photos at our Facebook.com/parksandtrails and Instagram.com/parksandtrailsmn pages with opportunities to win prizes if you guess, “Where’s Karl?” this time. It’s an adventure for sure, but one that more than just for fun. The bike Karl is riding is equipped with a variety of gadgets to record the condition of the trails. 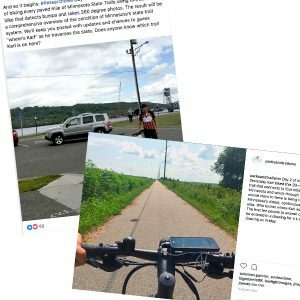 The main gadget is an iPhone, mounted on the bicycle’s handlebars, running an accelerometer app that tracks the severity of every bump he hits along the trail. This data will be compiled and analyzed, similar to how it was in our first State of the Trails report, but with increased reliability since the data is all collected using the same bike, rider, and device, rather than the many differing variables from numerous volunteers who contributed data to the previous report. 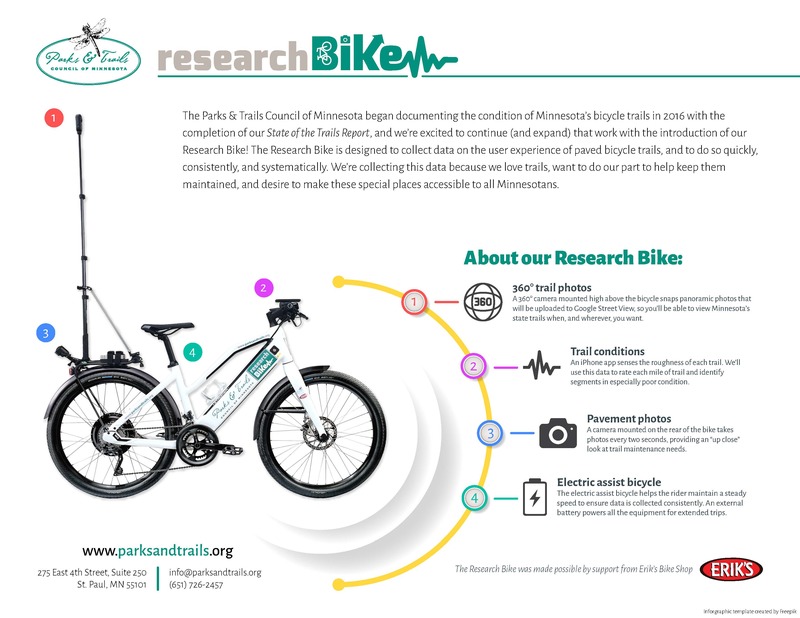 The bike itself is an electric-assist bike that was generously donated by Erik’s Bike Shop. With 600 miles needing to be covered in a short period of time, such an “assist” seemed a prudent and safer option for an intern. Mounted on a tall pole on the bike’s rear rack is a 360-degree camera that snaps photos similar to what users see from Google Street View. Finally, another camera is pointed to the ground to snap photographic records of the pavement conditions. Having a comprehensive understanding of the condition of Minnesota State Trails is essential to our goal of ensuring trails are maintained and vital new trail connections continue to the built. Trails are an essential component to a healthy and safe transportation infrastructure for our state, plus they offer outstanding outdoor recreation and connections.